Does My Dog Need Flea and Tick Prevention? Alright guys … big announcement on our end! We are moving from San Diego to Montana! Open spaces, here we come! I am excited for more opportunities for the outdoor adventures I live for – trail running, camping and hiking! But with more outdoor activities comes … more ticks. Hopefully fewer fleas, but no doubt there will be more ticks and more mosquitoes. Since we are relocating, it’s a good time to reevaluate what my dog and my cat need for protection against fleas, ticks and heartworm. It’s never a “one size fits all” situation, and I thought this might be a good time to remind you to reconsider what your pets need for protection and to ask your vet any questions you have. This post is sponsored by Ceva Animal Health, the maker of Vectra® 3D for Dogs, a monthly, topical flea and tick preventive. Ceva Animal Health is giving away a 6-month supply (6 doses) of flea and tick prevention to one lucky reader of That Mutt. To enter, just leave a comment at the end of this post. *This giveaway has ended. 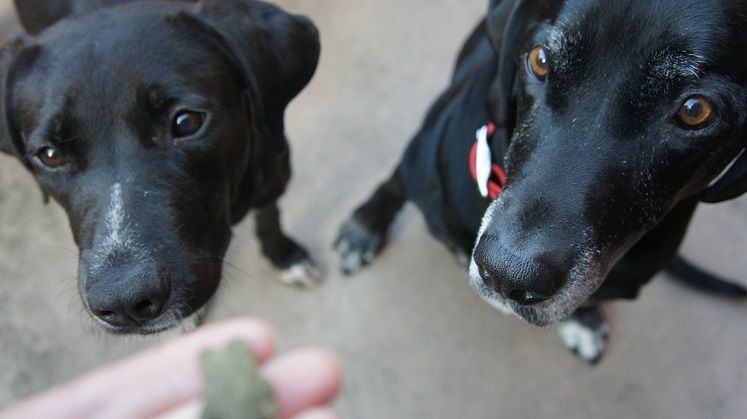 Does my dog need flea, tick and heartworm prevention? We should all consider what our dogs and cats need for flea and tick protection as we go through various changes in life. Obviously moving to a new region is a big reason to think about what kind of parasite protection your pet might need due to different types of weather and what kind of “pests” thrive as a result. For example, heartworm is transmitted by mosquitoes. While this is something to be aware of in most of the United States, it’s far more common for dogs to get heartworms in the South vs. the Pacific Northwest. You can view the map of documented cases of heartworm in dogs for the U.S. in 2016 here. 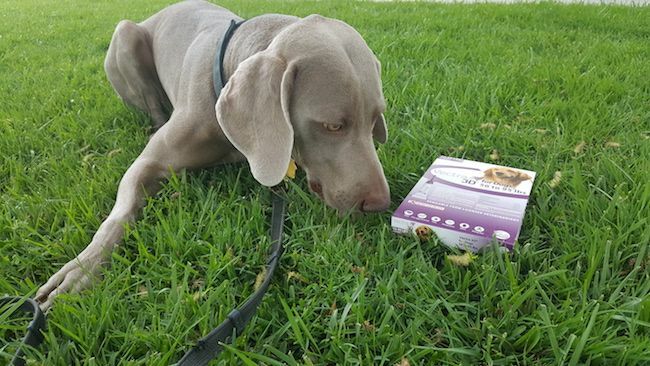 Vectra® 3D is not a heartworm preventive but in addition to protecting dogs from fleas and ticks, it also protects dogs from mosquitoes before they bite your dog. Learn more about Vectra® 3D here. Even if you move within your own county, there might be more fleas in some areas within the same county than others. San Diego County in California covers a huge area, and fleas are much more of a nuisance in some parts of the county vs. others. 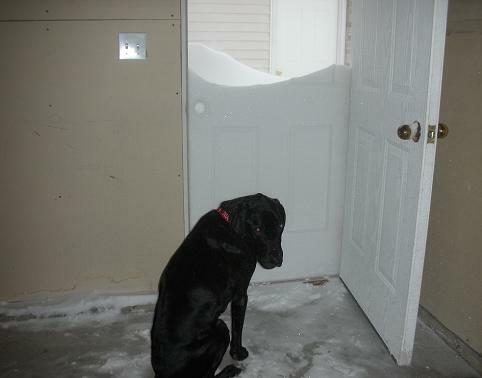 So even if you’re not moving very far, your pets might end up needing additional protection. Or, if you move from a home with hardwood floors to a home with mostly carpets, unfortunately there could be a higher chance for fleas to multiply by laying their eggs in the carpet! Yuck. Learned that the hard way. Hardwood floors are the way to go when you have pets, if you ask me! 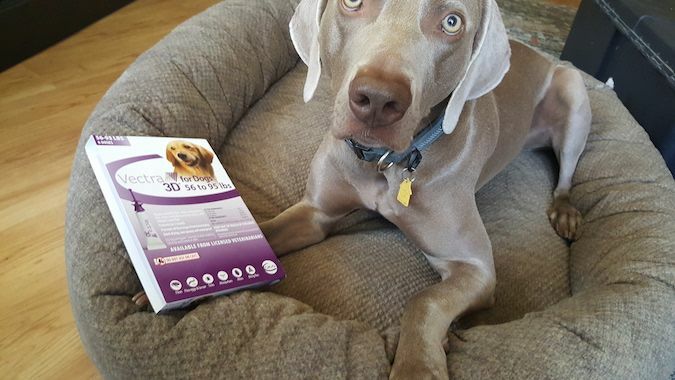 If you’re having an issue with fleas in your home, one option for protecting your dog is Vectra® 3D for Dogs. This product kill fleas of all life stages BEFORE they bite your dog. Then … we had a very mild winter around 2012 where it was unusually warm for that area with no snow. Well, that summer I saw quite a few ticks on my dog (and on me! ahh!) even though our activities did not change. The winter just hadn’t been as brutal. Another note on weather, if you move from a colder region to a warmer region you might need to consider year-round protection for your pets. I know, not fun. Learned that the hard way too. 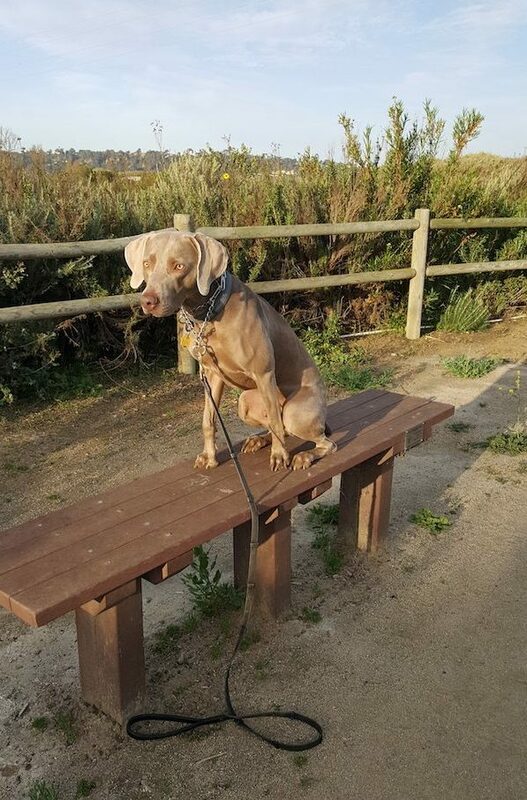 I never saw a tick in San Diego until I recently started doing a sport called canicross with my young dog, Remy. This is a running sport where your dog is tethered to you and pulls you while running. It’s awesome! It’s the perfect sport for Remy. However, once we started exploring more and more trails through canicross, sure enough, the ticks found us! I didn’t even think there were ticks in San Diego! Wrong! And like I said earlier, I typically did not need to worry about ticks when we lived in North Dakota. Yet, some of my friends in my own neighborhood would find ticks on their dogs because they did a lot more hiking than we did. It just goes to show that each dog is different depending on your lifestyle. If you are looking for a flea and tick preventive, Vectra® 3D for Dogs is one option that is effective and easy to apply. Learn more here. If you travel with your dog, you’ll want to make sure he’s protected based on where you’re headed. Heartworm is a much greater risk in the South, Midwest and East than it is the Pacific Northwest. Fleas are much more common in the South, too. Oh, the joys! And even if you board your dog or cat, you might need to consider flea protection just because he’s going to be in a space with a LOT of other dogs around. My pup Remy has come home from the boarding kennel with fleas. Oh, lucky us! If you add a new pet to your family, you’ll need to consider what type of protection they will need. That goes for temporarily fostering an animal, too. You don’t want your foster dog or cat to transport fleas to your existing pets. We foster dogs and cats directly from the shelter or “pound” on occasion, and I always request that the animal is treated with flea prevention before I pick them up. I just don’t want to deal with the added hassle of fleas. Fostering a dog is enough work on its own. 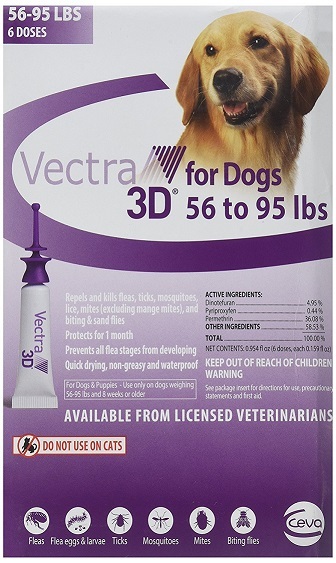 You can purchase Vectra® 3D for Dogs through your veterinarian. Each pet is going to have unique needs depending on where you live and the activities you do. Even in the same household, one of your dogs might go hunting while the other is a pampered, indoor pup. And even then, they might both need protection. Heck, fleas can even enter your home on YOU. The same is true for cats. Maybe you have one cat that stays indoors and one that lives in the barn. Maybe they both need flea prevention or maybe not. It just depends! If you’re not sure about your area or the area you’re headed, it’s best to talk with a local vet. People who work at local animal shelters or dog training or boarding facilities would also be pretty knowledgeable. As I said earlier, one option for topical flea and tick prevention is a product called Vectra® 3D for Dogs. This product kills and repels fleas, ticks and mosquitoes before they bite your dog. It also kills and repels biting flies and mites (excluding Mange Mites). NOTE: Vectra® 3D is NOT safe for cats. Giveaway info – win a 6-month supply of flea & tick prevention! *This giveaway has ended. Congrats to Allison C.
Ceva Animal Health is giving away a 6-month supply of flea and tick prevention (6 doses, 1 pet) to one reader of That Mutt. Must have a U.S. mailing address to win. To enter, just leave a comment below so I know you want in on the drawing. What is the flea and tick situation like where you live? I’ll choose the winner at random on Thursday Aug. 9. The winner will be notified by email and posted here. 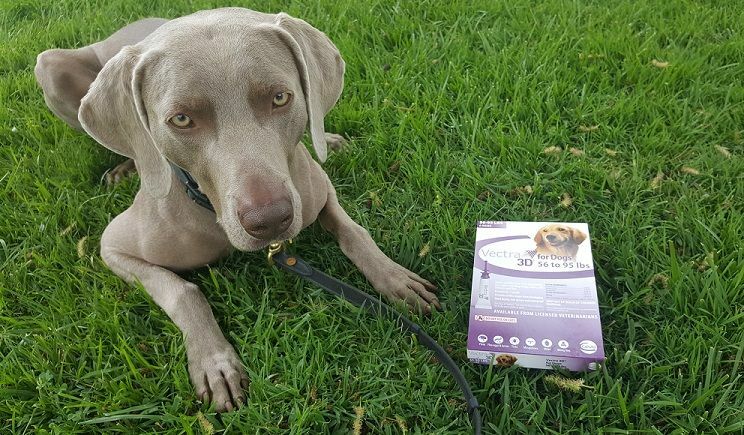 Are you interested in trying Vectra® 3D for your dog? Prevention is important. Enjoyed the post & would like to be entered in the drawing. Having a flea infestation in the house once was enough to encourage me to never – NEVER EVER – skip flea prevention for my animals. Living in Missouri, I am always looking for the right coverage for my dog Agnes. Great post!! We’ve been doing flea & tick treatment on Clementine. We live in a pretty suburban area, but I’ve definitely seen ticks in my yard in the past. Tick diseases and mosquito borne diseases are just so scary. The mosquitos are terrible in my yard, especially lately, we’ve had so much rain! Great, I had an infestation over 20 years ago, I promised myself never again. It was very expensive to remove especially that long ago. I dont want my dog to ever have to deal with fleas or ticks. We lived in Billings MT for 4 years, never saw one tick. We did a lot of hiking and exploring so I think you will be good. After reading all the bad stuff and chemicals they put in flea and tick medicine, I only use natural stuff to help my dogs have a longer healthier life. I swear by Revolution. I’ve never used anything else. We started off pet-ownership with a full-blown, apartment-wide case of ringworm that affected all 3 of our adult cats,and ourselves, for six months, after taking in a pair of infected (unknown to us) kittens to help out a friend. I loved all of the pests it (at the time) claimed to treat. The product has made adjustment to those claims over the years, but I’ve NEVER had an issue with any sort of pest/parasite since. All 4 of my dogs have been on it, year-round, for their entire lives. We’ve just returned to my hometown, after spending 7 years in Houston, 1 in D/FW, and 2 in Oklahoma City. Never had any flea issues, and just a couple of ticks in D/FW, courtesy of a pair of foster puppies that passed through our home for a time. For the past year, I have experimented with a different product on my current two dogs, and I have to say, having never had an infestation at all (a 3-dog, 4-cat household, for the better part of 17 years), that Revolution really does work best- now that we spent the early part of the summer sharing the house with fleas. There are a lot of deer in our current area, and there has always been a big flea population in this neighborhood (it’s the one I grew up in, and fleas were a constant back in the 80s, before monthly prevention products became popular). Nothing much has changed, in that regard. Oddly enough, we’re remodeling, so the floors are nothing but concrete slab/tile, and there’s no carpet. I spent a good two months stepping up my already daily vacuuming, washing bedding weekly, bathing dogs and cats. I started treating the yard with Wondercide, at a friend’s suggestion, and I do think it’s working. I’m not finding fleas on the dogs when they come in from the outdoors, anymore. I put them all back on Revolution last month, however, and there has been no itching/scratching since. I’d even resorted to going over the cats daily with a flea comb- something I’ve never done, because our two remaining cats are 17 years old, and I’d really rather not have to subject them to the pesticides in flea/tick products at this point. I definitely intend to continue with monthly applications of Wondercide (which is a locally-made, concentrated cedar oil product) in the back yard, and I’ll stick with my tried and true Revolution, for sure! It would be nice to be able to avoid pesticides altogether, but at least I don’t have to spray the yard with them. I also foster. I have tried checking the foster dog/puppy before it comes in the house. That doesn’t always work. Then when I see my dogs scratching. Then I think, is it from a flea or a mosquito? Reading what Vectra 3 does for your dog provides the safeness I am looking for! All my four cats are on Catego made by Ceva Health company with success. Fleas and ticks are no joke here in Georgia. When we lived in Chicago it’s hardly a problem. Not here, all year round including the mosquitos! One of the cats goes in and out so we have them all on Catego just to be on the safe side with no problems. Unfortunately we couldn’t find the dog version in the store nearby to try. Also we just had a baby so to us it’s a great means of protection from pest infestation for the new house and our lil guy. Would like to try the dog one! My dog, “Dawg”, is constantly in the deep woods where he picks up who knows what. I would really like to try this product. Thank you. Living here in the Boston area, ticks are a major problem ! I have actually pulled more ticks off me than my 2 dogs. I’m not sure if I’m getting them from the vegetation or the dogs ! Yuck. I use revolution as my go to flea and tick preventive plan. That being said, it does not cover all species of ticks and I have found numerous ticks on my big boy. Thankfully, I do know to check and normally check every few hours, at least the tick hotspot areas with a full check daily! Would love to try this! Although flea and ticks are not a problem in Phoenix, AZ. My wife and I like to go hiking with our dogs in Flagstaff and Sedona where it’s cooler. 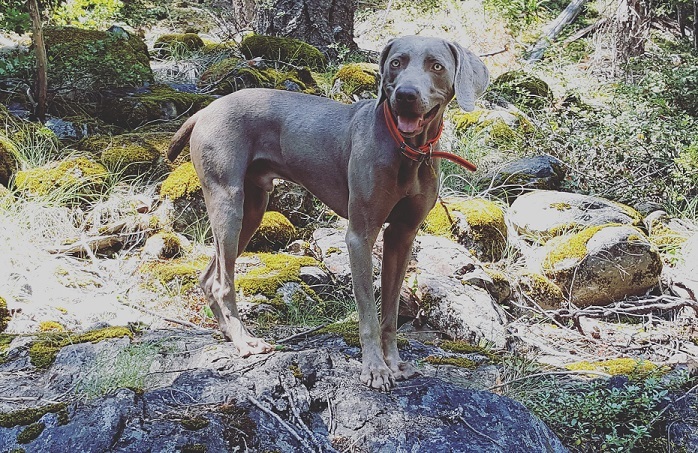 With all the trees and woods, it’s imperative to have flea and tick prevention for my dogs. I too just had a horrible run in with fleas!! I was using the regular monthly topical but in talking with Molly’s Dr. it hasn’t been working very well for a lot of people this year. I just got a 1 month of an anti-flea pill to see if it works, so far I haven’t seen any in the past week. The ticks are HORRIBLE in CT! I have gotten as many as 20 ticks off of my dog after going on a hike. This would help so much! Trying to keep up with 4 personal dogs plus 17 fosters but we do not skip flea or heartworm meds. One incident is enough to set back a rescue. Thank you! Would love to win this so OSO & I can stay flea free! I would like a chance to try this flea and tick product. Right now my dog Tex is on NexGard chewables for fleas and ticks. He is also on Tri-Heart Plus for heartworm prevention. I keep all my dogs on these two prevention year round. Such pretty dogs and pictures!! We have two elderly ladies (a beagle/sheltie that we adopted and a deaf lab that got dumped on us after we offered to temporarily foster her), and a jack russell/dachshund puppy. I feel like we’ve been in a never ending battle with fleas for years. My vet recommended Seresto collars last year and they worked ok for the dogs through the winter, but I bought my new puppy a collar in May and it hasn’t done a single thing. I feel so bad for them and intend to get something topical from the vet tomorrow, along with spraying the house and yard for fleas (again). Thankfully most of the ticks I’ve found have been in my hair and not the dogs’ fur. Creepy little guys! Thank you, glad you liked the pictures. Congratulations on you upcoming move to Montana! I use Advantix(r) on Joey and apply it to the back of his neck where he cannot lick it. I also comb him weekly with a fine-toothed comb to rid him of flea dirt, loose hair and surviving fleas. It is interesting that Vectra(r) is applied from base of the tail and along the back to the neck. This seems to make more sense since the fleas that survive application at the neck will surely move to untreated parts of the body such as the tail! We have fleas here in the Portland, Or, area so I keep Ranger treated year round. I also have two indoor cats but as long as Ranger is treated the cats stay flea free. I just adopted a shelter dog on Sunday who currently has been diagnosed with Lyme Disease. Dexter is undergoing treatment now. He has to be on a regular flea and tick preventative to avoid a possible relapse. I also have 2 house cats (Ruby andSally) that need to remain bug free!! Living in Florida we deal with fleas and ticks all year long. Vectra 3D is an amazing product. I actually apply this to my horses as well and it keeps the ticks as well as the flies at bay. My Vet recommends Vectra 3D. It is the best prevention for fleas ticks and mosquito’s. This summer in Maine we are having a terrible outbreak of fleas ticks and mosquito’s The weather has been extremely hot and humid.Vectra 3D has been a life saver for my little dog not only for fleas ticks and mosquito’s but for small flying insects that would try to target my little dog’s face. Vectra 3D is awesome!I highly recommend Vectra 3D year round protection Even in the winter! Being a dog walker/sitter,we often find ourselves in the woods. I’d love to give away the tick/flea prevention to whichever client needs it! 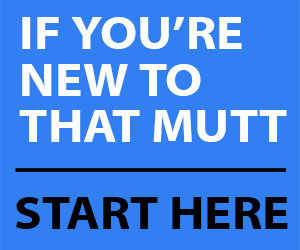 It would help me a lot with my little dog. We’ve gone to year round heartworm protection being recommended in Minnesota. My dog is on Nexgard for 6-8 months depending on when there’s a good hard frost. She’s also vaccinated for Lyme and sprayed with Wondercide before outdoor activities. Good luck with the move! Enjoy Montana – all the photos I’ve seen look gorgeous and there will be so many adventures to be had! We just moved to San Francisco from Seattle and there are ticks everywhere! I had no idea there were so many. We give our dog Ervin flea / tick treatment once a month and check him after every walk/hike. This has definitely been eye opening since I was only used to ticks in Eastern Washington. Canicross sounds like a lot of fun! I can’t wait to try that with my puppy when he’s older. I live in North Dakota and we’re having a vicious tick and mosquito season this year. I’m also doing a lot more trail walking/running so I’m seeing a ticks on me or my puppy almost every other walk. I’m currently looking into tick and mosquito prevention items (I got a trial one from the vet to try) so I hope I win this drawing contest!! Isn’t it horrible? I can’t quite believe it. I check myself and my dog after every walk, and I have only found one tick (on me)…knock on wood. I don’t know how that’s happened given how bad they are. But the mosquitoes – they are really something else this summer. Ticks are a huge problem in MA but fleas are not normally as bad. I did get 1 foster dog in though that had so many fleas on her the water ran red when I gave her a bath. It was awful! I’d like to try vectra on my dogs! I have a labradoodle that’s a little over a year old. We travel back and forth from college to my home. When I’m home I love to take him to my friends farm to run around and play with her dog which he absolutely loves! Sadly traveling to these different places he gets fleas easily. Even though I wash and use flea spray on him it doesn’t quite do the job and my poor baby gets eaten up and is always itching. I am looking for a good flea medicine to use on him so he stays healthy and feels good in his own skin. Loved the pictures. Why Montana? i don’t have many problems with fleas, however, i do have lots of ticks, since I live in the country and there are lots of deer in my yard. I try to use all natural as much as possible, but sometimes it takes a chemicals to really protect my girls if the ticks are bad. they are so small, the size of a pin head. I try to check them each time we go out. Moving to Montana! I just left Montana a few years back and can tell you that your lifestyle is perfect for it. The amount of outdoor activies is endless. I hope you love it as much as I did. Currently I am in Texarkana, AR and we battle all the bugs all year round. I miss the cold Montana winters that help cut them back a bit. With 5 animals and endless fosters I could always use so free flea and tick prevention! Here in Newark, Delaware, we may be a small state but we have a big problem with fleas, ticks and mosquitoes. 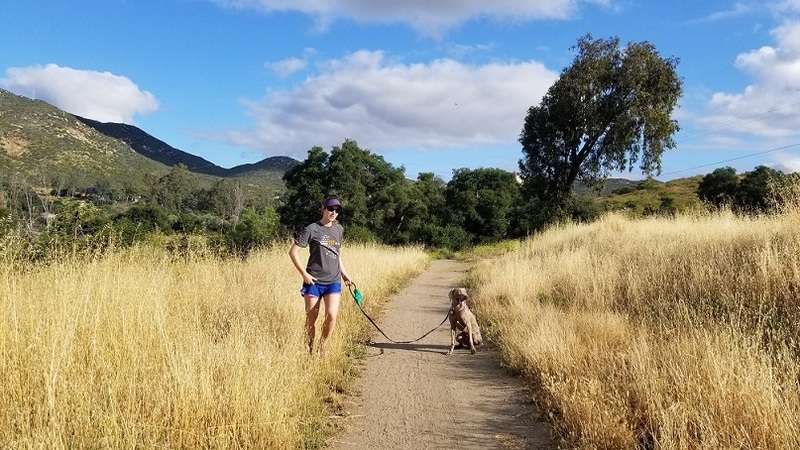 My little chihuahuas just love going everywhere on walks with me and are outside with their cat siblings often too so we could definitely use Vectra 3D!